If you know how a ‘meringue chantilly’ looks like, you’ll notice that mine aren’t how they’re supposed to look like. Meringues chantilly are a sandwiched cookie, very much like a macaron, made out of two meringues sandwiched with whipped cream, the chantilly. I baked the meringue disks and they looked so perfect, I didn’t bother filling them with the whipped cream. It seemed such shame to disturb such a rustic beauty. I set up a bowl with whipped cream to dip the meringues in if anyone would be interested, but no one has so far. Rating 5 out of 5. Meringues Chantilly: Adapted from pâtisserie Mulot. Dorie Greenspan - Paris Sweets. 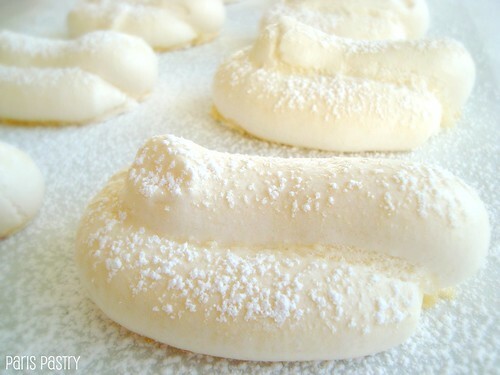 - To make the meringues: Preheat the oven to 250°F (120°C). Line a baking sheet with parchment paper, and fit a large pastry bag with a plain ½-inch tip. Put the egg whites in a clean, dry mixer bowl, fit the mixer with the whisk attachment, and start to beat the egg whites at medium-low speed. When the egg whites turn opaque and start to thicken, increase the mixer speed to high – but don’t walk away. When you see that the whites are forming peaks, add the granulated sugar in a stream, then continue to whip until the whites form firm, glossy peaks. Switch to a rubber spatula and gently and gradually fold in the confectioners’ sugar. Work quickly and delicately so that you deflate the batter as little as possible. The meringue is now ready and should be used immediately. - Spoon the meringue into the pastry bag and pipe out about 12 plump mounds (part oval, part lozenge), each about 3 inches long by 2 inches wide by about ½ inch high (7,5 × 5 × 1.5 cm), on the baking sheet. Dust the meringues with confectioners’ sugar (a sieve or a sugar duster does the job best) and let them sit on the counter for about 10 minutes so that the sugar can pearl, or form little beads. - Slide the baking sheet into the oven, slip the handle of a wooden spoon into the oven to keep the door slightly ajar, and bake the meringues for 2 hours, until they are firm, dry, and very lightly caramel colored. Turn off the heat, close the oven door, and allow the meringues to dry in the oven for 4 hours or for as long as overnight. (I must admit, I did not do this – it was fine.) When they are cool, run a metal spatula under the meringues to loosen them from the paper. 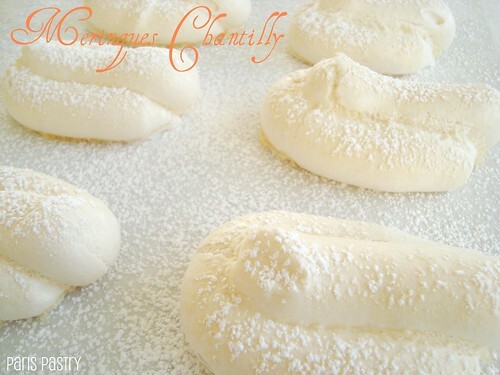 - To make the chantilly: Fit a pastry bag with a ½-inch star tip. Pour the cream and vanilla extract into a mixer bowl, fit with the whisk attachment, and, working at medium speed, begin to whip the cream. When the cream starts to form soft peaks, gradually add the confectioners’ sugar. Increase the mixer to high speed and whip the cream until it holds firm but supple peaks. - Spoon the cream into the pastry bag and pipe a pretty twist of cream onto the flat of one meringue. Sandwich the cream with the flat of a second meringue, place the sandwich on the long, thin sides of the meringues. Continue with the rest of the batch. I've never even heard of these but they look like some kind of wonderful! I would love one of these...or two or 12! :) Look delicious. all jouw recepten weerspiegelen de witheid van buiten :) erg mooi gemaakt weer!! I've gotta say they look pretty yummy on their own, but I'm not one to resist fresh whipped cream! Very pretty, Danielle! I can see why you didn't want to mess with a good thing.